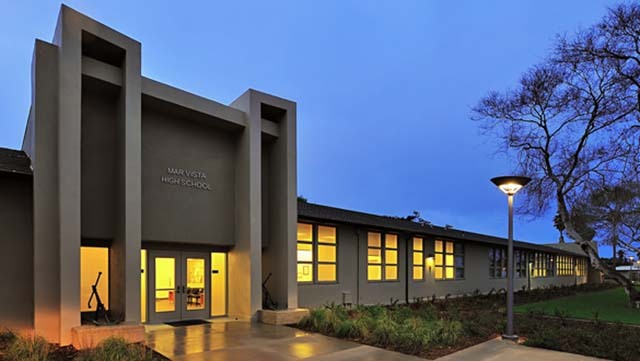 Multiple telephone threats that later proved to be false forced Mar Vista High School in Imperial Beach to transition into a “secure campus mode” on Thursday afternoon while deputies performed a security check of the school. The phony threats were phoned into the school at 505 Elm Ave. about 1:05 p.m., San Diego Sheriff‘s Sgt. Leonel Gurrola said. The threats sounded like they were being phoned in by kids, he said. The threats included shooting at the school but no specific target, person or time was cited. Laughing could also be heard in the background of the call, Gurrola said. The phone number used to call the school was verified as not being real. Deputies conducted a sweep of the school and remained on campus providing extra security until all the students left the school, Gurrola added. The sheriff’s department was continuing their investigation into the phony threats and intends to have the callers prosecuted. Anyone with information on the prank calls was asked to call the sheriff’s department at (858) 565-5200 or San Diego County Crime Stoppers at (888) 580-8477.